Buick and Lexus will put the game in customers' hands during March Madness, betting on NCAA partnerships for consumer engagement and marketplace penetration. Buick is offering current owners in the U.S. with OnStar 4G LTE-equipped vehicles free unlimited Wi-Fi data for the month to stream 130 men's and women's college basketball games. Offering promotional streaming services, or advertising through them, is increasingly becoming the most efficient method of reaching prospective buyers. CBS data indicates last year's March Madness live-streaming views increased 33 percent from the year prior to 22.4 million hours of live online viewing. "The NCAA is the ideal partner as far as demographic and psychographic opportunities," GM spokesperson Stefan Cross told Automotive News. "It allows you to reach a highly desirable audience, either right at the target buyer or raising awareness for potential buyers." Drivers without active data plans can sign up online between March 12-16 to start the 30-day free data plan, acting as a second trial free of data services. An in-vehicle app, which will automatically update into eligible Buick vehicles, will also offer live audio feeds of the game. Accessible in the vehicle's infotainment system, drivers can select which game to stream if simultaneous games are on. The app, which was closely developed with the NCAA, will remove itself automatically when the tournament ends. Since launching the unlimited data plan option with AT&T last March across all GM vehicles, the average number of gigabytes of data consumed per month in Buick vehicles increased more than 150 percent. "We did notice that there's typically more online streaming during March Madness than other months for sure," Cross said. 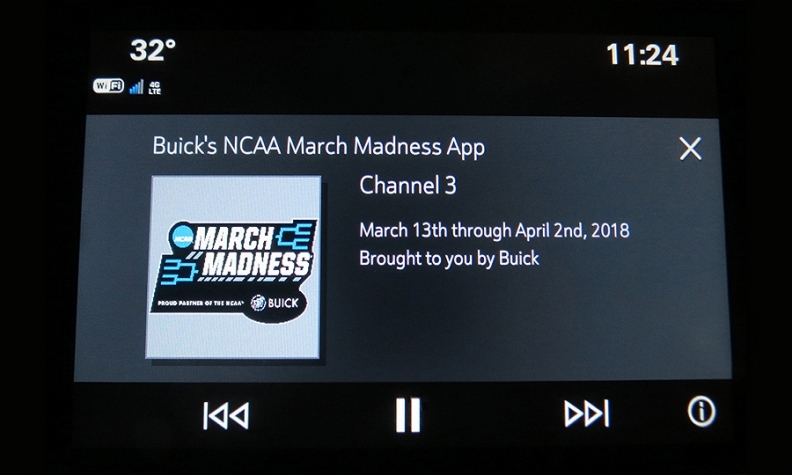 "The fact that Buick already had a partnership with the NCAA made sense to offer this data for free in 2018 so customers can take advantage of online streaming without having to worry about specific data costs." Lexus also found NCAA partnerships ideal for customer penetration. Partnering with Oath, a Verizon Communications subsidiary, Lexus will continue its three-year sponsorship of Yahoo Sports' Tourney Pick'em on the Yahoo Fantasy app to promote the 2018 Lexus RC F.
New this year is the brand's premiere sponsorship presence on the Yahoo Fantasy App, where fans can share their brackets with friends. Last year, registrations for Lexus' bracket game on Yahoo Sports surged 38 percent, the brand said, compared to the year prior. Instead of picking the winning team, the game is to pick the quickest matchup to 60 points. Oath data purports that more than one in four consumers considers himself/herself a college basketball fan. In 2017, 45 percent of Americans tuned into the NCAA men's tournament, with a total of 93.5 million live streams nationwide. In addition to branding on the Yahoo Fantasy App, Lexus will be featured in 15-second video ads on Yahoo Sports throughout the tournament.